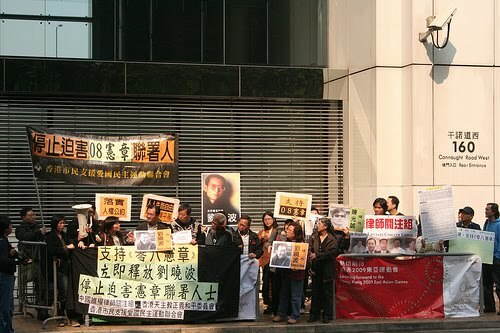 The Chinese government signaled a major escalation in its policy of repressing dissidents with this week’s conviction of dissident intellectual Liu Xiaobo on charges of subversion (New York Times link). Liu’s eleven-year sentence on charges of subversion sends a chilling message to all Chinese citizens who might consider peaceful dissent about controversial issues. Other dissidents have been punished in the past year, including environmental protesters, advocates for parents of children killed in the Sichuan earthquake, and internet activists. But Liu is one of the first prominent activists to be charged with subversion. Liu is a major advocate of Charter 08, and his conviction and sentencing represent a serious blow to the cause of political liberalization in China. Regrettably, the regime of citizen rights of expression, association, and dissent has not yet been established in China. What is involved in advocating for “legality” and “individual rights” for China’s future? Most basically, rights have to do with protection against repression and violence. These include freedom of association, freedom of action, freedom of expression, freedom of thought, and the right to security of property. History makes it clear that these rights are actually fundamental to a decent society — and that this is true for China’s future as well. Moreover, each of these rights is a reply to the threat of violence and coercion. Take the rights of expression and association. When a group of people share an interest — let’s say, an interest in struggling against a company that is dumping toxic chemicals into a nearby river — they can only actualize their collective interests if they are able to express their views and to call upon others to come together in voluntary associations to work against this environmental behavior. The situation in China today is harshly inconsistent with this ideal: citizens have to be extremely cautious about public expression of protest, and they are vulnerable to violent attack if they organize to pressure companies or local government to change their behavior. The use of private security companies on behalf of companies, land developers, and other powerful interests in China is reasonably well documented. And these companies are largely unconstrained by legal institutions in their use of violence and gangs of thugs to intimidate and attack farmers, workers, or city dwellers. It’s worth visiting some of the web sites that document some of this violence — for example, this report about thugs attacking homeowners in Chaoyang. Similar reports can be unearthed in the context of rural conflicts over land development and conflicts between factory owners and migrant workers. So this brings us to “legality.” What is the most important feature of the rule of law? It is to preserve the simple, fundamental rights of citizens: rights of personal security, rights of property, rights of expression. What does it say to other people with grievances when private security guards are able to beat innocent demonstrators with impunity? What it says is simple — the state will tolerate the use of force against you by powerful agents in society. And what this expresses is repression. It is also true that the state itself is often the author of repression against its own citizens for actions that would be entirely legitimate within almost any definition of core individual right: blogging, speaking, attempting to organize migrant poor people. When the state uses its power to arrest and imprison people who speak, write, and organize — it is profoundly contradicting the core rights that every citizen needs to have. It should also be said that these legal rights cannot be separated from the idea of democracy. Democracy most fundamentally requires that people be able to advocate for the social policies that they prefer. Social outcomes should be the result of a process that permits all citizens to organize and express their interests and preferences — that is the basic axiom of democracy. What this democratic value rules out is the idea that the state has a superior game plan — one that cannot brook interference by the citizens — and that it is legitimate for the state to repress and intimidate the citizens in their efforts to influence the state’s choices. A legally, constitutionally entrenched set of individual civil and political rights takes the final authority of deciding the future direction of society out of the hands of the state. Give the Chinese people democratic rights and they can make some real progress on China’s social ills — unsafe working conditions, abuse of peasants, confiscation of homeowners’ property, the creation of new environmental disasters. Deprive them of democratic rights, and the power of the state and powerful private interests can create continuing social horrors — famine, permanent exploitation of workers, environmental catastrophes, development projects that displace millions of people, and so on. The authoritarian state and the thugocracy of powerful private interests combine to repress the people. « What makes a sociological theory compelling?